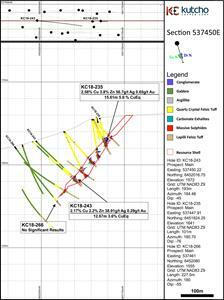 VANCOUVER, B.C., Nov. 20, 2018 (GLOBE NEWSWIRE) -- Kutcho Copper Corp. (TSXV: KC) (OTC: KCCFF) (“Kutcho Copper” or the “Company”) is pleased to announce drill results from the Main deposit at its 100% owned Kutcho high grade copper-zinc project located in British Columbia. 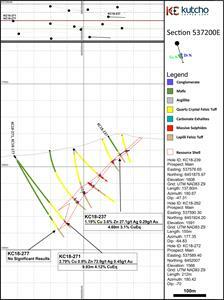 Hole KC18-285 intersected mineralization extending Main an additional 40m from historic drilling, further expanding the size of the Main deposit beyond the existing resource model. 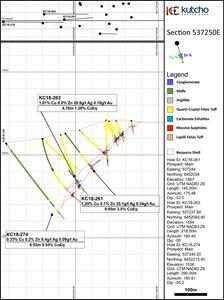 KC18-268, KC18-282 (previously released - 5.4m of 4.0% CuEq*) plus KC18-285 all intercepted mineralization along 250m of strike below the previously defined down-dip edge of the Main deposit mineral resource estimate. 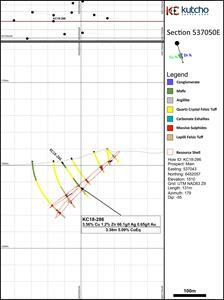 The drill program at Main was designed to reduce the drill hole spacing in the Main inferred mineral resource and test the down-dip mineral potential across the deposit. 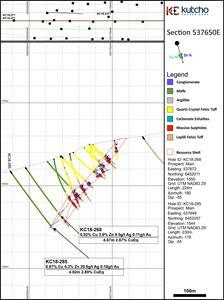 This program was very successful and points to further mineral resource expansion potential with 450m of strike along the down dip edge of Main deposit remaining open. True width estimated to be 90% length of intercepts. Base metal assays are first determined using the ME-ICP41 method, which reports results as part per million (ppm). 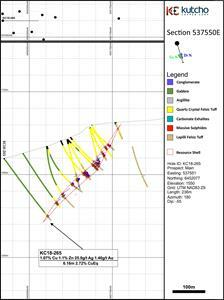 All analyses that reach the overlimits of ME-ICP61 are reanalyzed with an Ore Grade method. The analytical results are verified with the application of industry standard Quality Control and Quality (QA/QC) procedures.